With the passing of Thanksgiving (can you believe it? ), there’s the head long rush into December and the various winter holidays celebrated as we enter the home stretch to end yet another year. From Christmas to Chanukah, Kwanza, and all kinds of Winter Solstice celebrations and more, how ever you celebrate the season, there’s plenty of festive fun to be had around Cook County. This is a perfect time to take a break and spread some cheer with family, friends and community. Speaking of spreading cheer, why not put a smile on a young kid’s face this season with a donation to the Palatine Township Holiday Toy Drive? Jut drop off a new, unwrapped gift for either a boy or girl at the Township Center on Quentin Rd by December 17th. Your gift will go to help make the holidays brighter for those in need. Until December 7th you can also drop off a gift toy at the Rolling Meadows City Hall or Library to donate through Toys for Tots. Head over to Spring Valley on December 1st for Christmas in the Valley; a day full of fun crafts and activities ideal for the whole family. The Volkening Heritage Farm & Merkle Cabin at Spring Valley will play host to an old-fashioned holiday gathering, circa the 1800s. Kids can Meet St. Nick, make some crafts and learn about past holiday traditions. Take a step back in time and enjoy a Victorian Christmas Open House at the Clayson House Museum & Library on December 2nd. Presented by the Palatine Historical Society this historic Victorian era home will be decked to the nines for the holidays. Take a peek at our past, enjoy some refreshments and live music too for a very Victorian Christmas. Get some holiday shopping done while supporting local artists and crafters at the Schaumburg Park Foundation Holiday Bazaar on December 4th or the 2018 Fremd Holiday Craft Fair on December 8th. Head over to William Fremd High School and discover some great holiday treats for the ones you love. Rolling Meadows is the place to be on December 6th for the annual community Tree Lighting Celebration & Spaghetti Dinner. Live music, seasonal treats and a visit from Santa Claus will all be on hand as the City lights up the community holiday tree. Head over to the Rolling Meadows Fire Department near by for spaghetti dinner; free while the food lasts; this is a wonderful home town celebration of family fun. 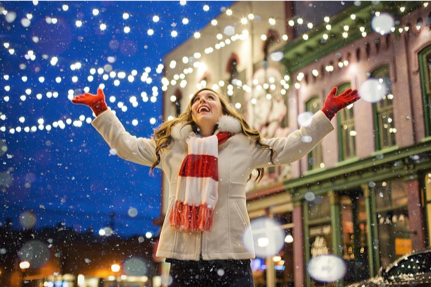 There are a variety of fun holiday activities and celebrations to enjoy around Cook County. No matter if you’re staying close to home or traveling for the holidays, I hope you and your family have a safe and joyful time throughout the season. Whether you are buying or selling a home, you want it to be a stress-free and easy process. Work with a local, experienced Realtor® so you can buy or sell with confidence. The Driscoll Properties Team is ready to put our expertise to work for you. Learn more at our website, DriscollProperty.com, then contact the Driscoll Properties Team at 847-533-6786 to help you discover the home of your dreams.